One of Texas' hottest artists and East Texas native, Koe Wetzel proudly presents the first-ever Koe Wetzel's Incredible Music Festival in conjunction with Radio Texas, LIVE! With Buddy Logan. 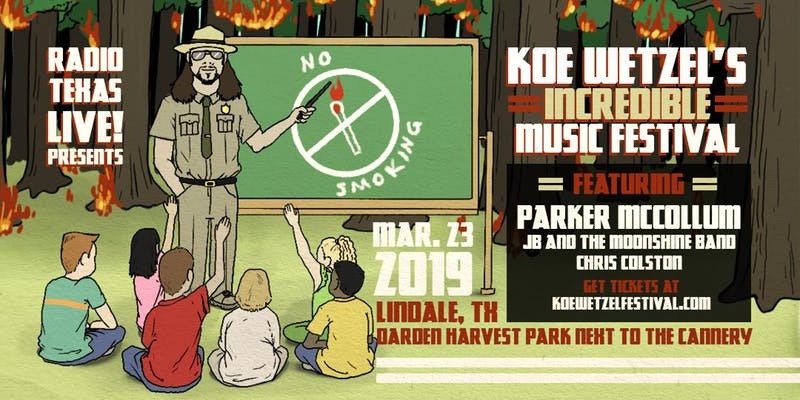 Join Koe, Parker McCollum, JB and the Moonshine Band and Chris Colston on Saturday, March 23, at Darden Harvest Park next to The Cannery in Lindale for what will undoubtedly be an unforgettable weekend -- and 100% Koe Wetzel.